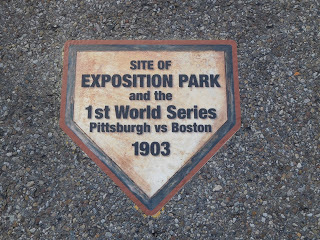 In 1995, when the Pirates were three seasons into their twenty year losing streak and playing at a decaying Three Rivers Stadium, while PNC Park was barely a gleam in Mayor Tom Murphy's eye, a group of Pittsburgh Chapter SABR members set about the task of determining the exact location of home plate of long gone and pretty much forgotten Exposition Park, where the Pirates played their home games from 1890 to 1909. (Disclaimer: This was before I became a member of SABR, so I can take absolutely no credit for this.) I wrote about this little venture back in October 2016, and you can reference it here. Well, weather, traffic, and, most likely, snow plows got the best of that marker, and in less than a year it was gone, and only a faint outline of yellow paint marked the hallowed spot. Thus began a quest, or, rather, the continuation of a quest by my friend Len Martin, one of those SABR guys who located the spot back in 1995, to make sure that this spot was permanently marked and would stand forever. This page was last updated December 26, 2018 at 4:03 pm MST.